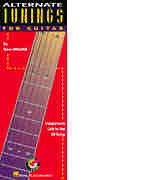 This pocket book contains a comprehensive guide for over 300 tunings. Arranged in alphabetical order-drop, open, modal, unison, slack, and hybrid tunings are discussed. For example, under 'B' you'll find you can tune your guitar BADGBE to achieve Soundgarden's 'Rusty Cage' sound.